As a professional photographer shooting video for a variety of client needs I don’t always have the budget to include a sound person as crew on every shoot I do. Beachtek has provided me a solution to controlling my audio. The Beachtek DXA-SLR audio adapter replaces the DXA-5D I enjoyed using last year to adapt and control professional audio gear for use with my video capable DSLR. It is small and can be attached to a camera body via the 1/4-20 stud and also accepts a 1/4-20 thread for mounting on a tripod or other support. Hint: It can save major time during shooting and editing if the audio and video is synced. Although there is very good audio/video-syncing software you still have to keep the audio and video files coordinated or you can have a major mess. One of the biggest stumbling blocks to recording good sound with any of the present day DSLRs is the lack of XLR professional audio connectors and in some cases audio level (trim) controls. The Beachtek DXA-SLR handles both of these issues allowing you to record synced sound right in the camera. It has a right and left channel XLR input connector with individual level controls, which allows for inputs from one or two sources using the industry standard balanced and shielded audio cables used with professional microphones. The adapter can also supply the 49v power needed by condenser microphones drawing the power from the standard 9V battery used to power the adapter itself. Adding to the professional capabilities is the line or microphone switch for each of the XLR channels. Each of the two channels has a good and peak level indictor. The DXA-SLR adapter also has a stereo mini plug input for devices like the Sennheiser EW100 Wireless kits I often use when a boomed microphone is impractical. The DXA-SLR has a switch, which turns on and off the Automatic Gain Control disabler, which when on keeps the AGC in cameras, like the 7D in check. Automatic Gain Control can create wild swings in audio levels, which causes major problems with your recorded audio. There is a headphone mini jack with a volume control to listen to what you are recording and playback from the camera. For playback you do need to hook up the camera playback via the two RCA inputs on the DXA-SLR. There is also a high or low gain setting for the preamplifiers in the adapter. 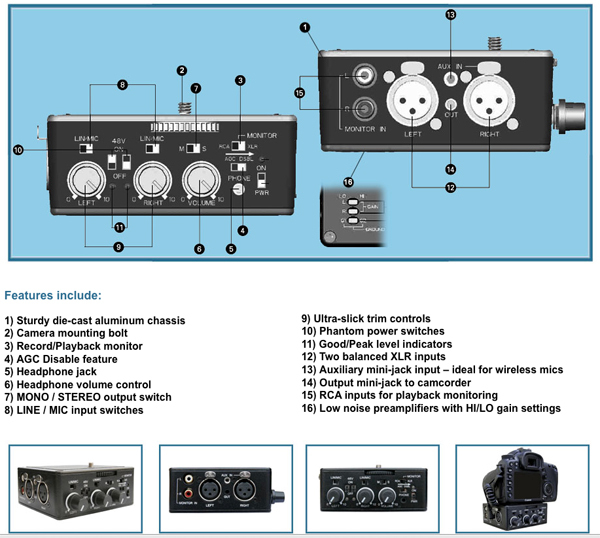 Take a look at the diagram below to get a better idea of all the controls the DXA-SLR has for your audio needs.